A list of the major attacks targeting tourists since the early 1990s includes 2004 attack in which Israelis were killed. A bomb ripped through a tourist bus in Egypt's Sinai peninsula near the Israel border Sunday, killing three South Korean tourists and their Egyptian driver and reportedly wounding 33 others. The attack was the first on tourists since a wave of unrest blamed on Islamists erupted across the country after the army overthrew president Mohamed Morsi in July. Here is a list of the major attacks targeting tourists since the early 1990s. - Oct 21: A British tourist is killed in southern Egypt. Islamist terror group Jamaa Islamiyya claims responsibility. - Feb 26: A bomb in a central Cairo cafe kills a Turk, a Swede and an Egyptian. Foreigners also among 19 wounded. - June 8: A bomb hurled into a tourist bus near the Giza pyramids kills two Egyptians and wounds 15, including two British tourists. - Oct 26: Two Americans, a Frenchman and an Italian killed and two other tourists injured at Cairo's Semiramis hotel. - March 4: Jamaa Islamiyya claims an attack against a Nile cruise ship. A wounded German tourist later dies. - Aug 26: A Spanish tourist in a minibus is shot dead by Islamist militants between the Nile towns of Luxor and Sohag. - Sept 27: Two Germans and two Egyptians killed in the Red Sea resort of Hurghada. - Oct 23: A Briton is killed and five other people wounded in two separate attacks on tourists in southern Egypt claimed by Jamaa Islamiyya. - April 18: 18 Greek tourists killed and 14 wounded in an attack outside a Giza hotel. Jamaa Islamiyya claims responsibility saying it targeted "Jewish tourists". - Sept 18: Nine German tourists and their Egyptian driver killed when their bus is firebombed outside Cairo's Egyptian Museum. - Nov 17: 58 tourists among 62 people killed in an attack on Hatshepsut temple in Luxor claimed by Jamaa Islamiyya. 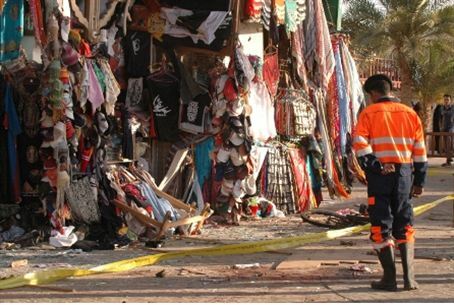 - Oct 7: Israeli tourists among 34 people killed in three bombings in the Sinai resorts of Taba and Nuweiba. More than 100 people wounded. - April 7: A blast in the mediaeval Islamic heart of Cairo kills two French nationals and an American as well as the bomber. - April 30: One person dies and eight wounded in a bombing near the Egyptian Museum shortly before police kill a woman and seriously wound another after they open fire on a tourist bus. - July 23: About 70 people are killed in three bombings in the Red Sea resort of Sharm el-Sheikh. Four groups claim the attacks, including one linked to Al-Qaeda. - April 24: At least 22 people killed and 150 wounded in three blasts in the Red Sea resort of Dahab. - Feb 22: A bomb at Cairo's landmark Khan el-Khalili bazaar kills a 17-year-old French girl and wounds more than 20, most of them tourists. - Sept 22: Masked bandits kidnap 19 foreign tourists and Egyptians at gunpoint in a remote corner of southwestern Egypt. They are freed unharmed 10 days later. -- Feb 16: Three South Korean tourists and their Egyptian driver killed in a bombing in the Sinai, the first attack to target holidaymakers in six years.